Vortex Hydro Energy of Ann Arbor, Michigan is developing generators to harness the energy from vortex-induced vibrations found in rivers, oceans, and other waterways with currents. Consisting of a simple mechanical system interacting with the natural vibrations that occur when water runs past a cylindrical object, the VIVACE converter could potentially generate 51 watts per cubic meter of water (moving at three knots) and could cost as little as $0.055 per kilowatt hour once the technology is mature. Marine engineers have been trying to reduce or eliminate the vortex-induced vibrations caused by water flowing over cylindrical rods for years. The oscillations damage offshore oil rigs and other marine structures relying on cylindrical posts. Vortex Hydro Energy CTO and Professor of Marine Engineering at the University of Michigan Michael Bernitsas was among the engineers trying to reduce this effect when he realized it might be possible to enhance the vibrations and use them to generate clean, inexpensive power. This lead Bernitsas and fellow researchers at the University of Michigan’s Marine Renewal Energy Laboratory to the VIVACE converter. 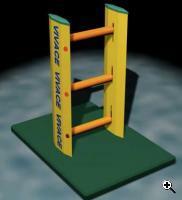 VIVACE (Vortex Induced Vibrations Aquatic Clean Energy) leverages a simple cylindrical rod between two vertical tracks. The rod moves up and down with the natural flow of water, generating mechanical energy that can be converted to electricity. While individual rods don’t generate that much energy, multiple rods could be stacked on top of each other and combined into multi-megawatt generators that are both compact and configurable for different types of waterways. In addition to their configurability and modular design, VIVACE converters can effectively generate power from much slower currents than most turbines and other water-based power generators. Turbines typically require at least five knot currents but the majority of water flows at less than three knots. VIVACE works without problems in these flows. In addition, turbines can negatively impact marine life, but VIVACE takes advantage of natural phenomenon that fish encounter regularly and should not interfere with their habitat at all. 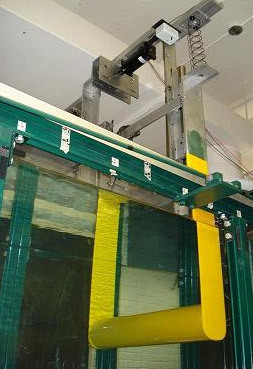 Initial design and testing of VIVACE was completed at the University of Michigan in 2005 using the Low Turbulence Free Surface Water Channel at the Marine Hydrodynamics Laboratory. A larger prototype is currently being designed and should be tested in the Detroit River in 2010. TFOT has reported on other sources of hydro power and innovative water-based technologies including snake-like Anaconda tubes that harness wave power, the AquaPod robotic fish cages, the HyWind floating wind turbine, and a deep water offshore wind turbine. More information on the VIVACE converter can be found at the University of Michigan Marine Renewable Energy Laboratory homepage. The Vortex Hydro Energy website also has information on VIVACE, including several videos including film of an early test at the Marine Hydrodynamics Laboratory.